Air Playit is new app for iPhone, iPad and Ipod which allows you to play video library stored on your home computer immediately wherever you go. 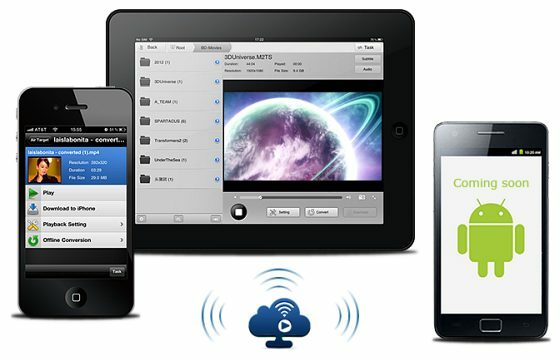 It supports remote streaming almost any auido & video to iPhone, iPad, iPod touch, and Android via WiFi 3G 4G network, acts as your personal clould server & player and let you watch videos on the go. Without the need of video conversion, Air Playit can instantly play any video & audio files and share them with friends and family effortlessly. This software is available for both Apple and Android versions. Support streaming all videos to iPhone iPad, including HD videos MKV, M2TS, AVCHD, TP, MPEG-TS, AVC, MOD, and regular videos MPEG1/2, WMV, ASF, AVI, MOV, RM/RMBV, FLV, MP4, H.264, M4V, WTV, WebM. Download all compatible audios video library to iPhone or iPad over WiFi, 3G, 4G network. Automatically cache all music files to the Download Library for easy playback on iPad, iPhone. Built-in HTTP server let you access the audios and videos stored on your PC or Mac via an web browser. Automatically list the playlist of recently played videos and remember the last play point for each video. Specify permissions to the shared folders: Admin, Kids and Public. Resume downloading at breaking-point. Air PlayIt lets you download from where you left off, or to start over. Does it support 3Gpp ?